THEME 3: Leading global players seek to leverage horizontal capabilities resident in China or India to achieve competitive advantage. Multi-National Coporations are gaining competitive advantage by leveraging core strengths across both geographies and partners. From a geographic standpoint, this could be termed “horizontal capability building” where capabilities resident in China or India are leveraged in the other respective market and beyond. Across the China-India geography, there is a full value chain of low-cost capabilities with the opportunity to achieve scale within those two markets. These scaled-up capabilities can then provide the foundation for successful global market expansion. For foreign MNCs, local partners in the Chinese and Indian markets can evolve from “market access partners” to “low-cost structure- providing go global partners”. In the case of Chinese and Indian companies looking to go global, foreign MNC partners can evolve from “technology and know-how partners” providing competitive advantage in the local market to “brand-and-distribution-providing go global partners.” From either perspective, partnering provides an opportunity to accomplish far more than either party could accomplish alone. An excellent example of this dynamic is General Motors’ leveraging of its Chinese partner Shanghai Automobile Industry Corporation across geographies to successfully compete in markets where it could not have done so alone. In China, like all foreign OEMs, GM is required to assemble and distribute product through partners. GM has taken this constraint and turned it to its advantage by leveraging the mutual strengths of not only its Chinese partner SAIC, but those of its Daewoo subsidiary as well. This has led to market-leading sales in China with 1.1 million unit sales in 2009 of a Wuling-branded minivan. By leveraging its partnership with Daewoo, GM has also been able to introduce lower-priced Chevrolet branded vehicles to China through its partnership with SAIC. GM and SAIC are now poised to replicate their success in India and beyond. GM/SAIC/Wuling plan to introduce a Chevrolet-branded minivan in India based on the Wuling low-cost platform. Consideration is also being given to selling this product in Latin America and other emerging markets, also under the Chevrolet brand. This can be seen as the first step of leveraging this partnership, driven by the scale of the Chinese and Indian markets, as the foundation for a powerful emerging market strategy. This major strategic effort would not have been feasible by either of these partners independently. From GM’s perspective, it now has the capability of deriving low-cost platforms from its Daewoo subsidiary while simultaneously securing low-cost assembly and economies of scale in China through its SAIC-Wuling partner. Working from this low cost-point, it can also benefit from leveraging SAIC’s Wuling brand name in China. These scale effects can be leveraged for entry into the Indian market. Since the Wuling brand would not be appropriate for the Indian market, the minivans will be sold under the Chevrolet brand. SAIC benefits from this relationship through a solid platform for sales in China, India and beyond, as well as the opportunity to achieve sales through GM’s distribution network and the Chevrolet brand name outside China. SAIC also benefits from GM’s localization of diesel engine production in India allowing for the appropriate powertrain configuration to be delivered to the Indian market at a competitive price. Given GM’s weakened position in North America and rapidly strengthening position in Asia through partnership, the potential exists for GM to be “reborn” as an Asia-centric growth company. In our next posting, we will address THEME 4: New pathways to innovation are made possible by leveraging core strengths derived from the geographies and capabilities of local partners. As General Motors Co. courts investors for next week's initial public stock offering, it's still struggling with losses in Europe and a weak recovery at home, but can point to one prize asset: its thriving operations in China. There, in the world's biggest auto market, GM has outrun most of its competitors. This year, GM and its venture partners have sold more than 2 million cars and trucks in China, generating $1.1 billion in income for GM, more than a fourth of its $4.2 billion profit through the first three quarters of 2010. It wasn't among the first automakers to venture into China, but in the 13 years since GM teamed with Shanghai Automotive Industry Corp., it has become a leading player there. Compared with the grim picture in Europe, where GM's losses deepened in the third quarter to $559 million, the business in China is providing steady income and growth opportunities. The two automakers are working together now to target the fast-growing Indian car market. As successful as the Shanghai Automotive-GM partnership is, analysts caution that it's hard to project a long-term value for GM's China business because of complicated politics in the new superpower, and intricate business regulations. GM's current success rides partly on unexpectedly strong growth in China's auto market, where 2010 sales are forecast to exceed last year's 13.6 million vehicles. But it also reflects smart moves by GM, which sells three times as many global-branded vehicles there as Ford Motor Co., according to J.D. Power and Associates. GM brought the right vehicles to China, and the right brands, said Bill Russo, president of Synergistics Ltd., a Beijing-based auto consulting firm. "They also happen to work with probably the best automaker in China, Shanghai Automotive," Russo said. "GM has cultivated a very good and healthy relationship with them." So good that Shanghai Automotive could become an investor in the GM IPO. Chairman Hu Maoyuan has said the company would consider buying GM shares, and U.S. Treasury Department officials have indicated they would not oppose it. Still, the unusual structure of the country's auto industry entails risks. Generally, automotive venture partnerships involve secondary, small-scale operations, but they're crucial in China, where foreign manufacturers may produce vehicles only in ventures with local carmakers. Joint ventures are inherently less stable than wholly owned businesses — and that's especially true in China, where most big domestic automakers have more than one partner, analysts say. State-owned Shanghai Automotive's other foreign partnership is with Germany's Volkswagen AG. The venture dates back to 1984, and also is flourishing. "It's no coincidence that the most successful auto companies in China are VW and General Motors, and they both work with this particular partner," Russo said. Drawing on the knowledge gained from its ventures, Shanghai Automotive is developing its own line of Roewe brand upscale vehicles. Last year, China experts wondered if GM's sale of 1 percent of its venture stake to Shanghai Automotive, conceding majority status to its partner, signaled a shift in the balance of power. Nick Reilly, now president of GM Europe but then head of international operations, told reporters last year that Shanghai Automotive had, in turn, helped GM gain access to Chinese banks. "GM was in desperate straits," said Michael Dunne, head of Hong Kong-based investment advisory firm Dunne & Co.
Joseph Liu, a former GM executive who works at Shanghai GM, said recently that Shanghai Automotive could become a competitor as it develops. But for now, he said, it's in GM's interest to have a strong partner in China. Analysts agree. "The reality is, the opportunity is so much greater than the risk," Russo said. This month, Shanghai Automotive and GM announced plans to deepen their cooperation and work together in key areas, such as the development of electric cars, and share more parts. The two automakers and their Liuzhou-based partner, Wuling Motors, also are developing entry-levels cars under a new brand, Baojun, which means "Treasured Horse" in Chinese. The venture partners are pooling their strengths — GM's production facilities in India and the Chinese companies' ability to produce small vehicles at low cost — to target the booming Indian and other South Asian markets. The deal marks the first time that a Chinese automaker is teaming up with a venture partner to tackle overseas markets. "That's huge," said Dunne, who is writing a book about GM's experience in China. "They're the most promising markets for the next 10 years." Staff Writers David Shepardson and Christina Rogers contributed. Nov. 10 (Bloomberg) -- General Motors Co., the largest overseas carmaker in China, has failed to replicate that success in India. To crack the market, the Detroit-based carmaker is enlisting its partner in China, SAIC Motor Corp. The alliance produces the best-selling vehicle in the world’s biggest car market, where it has a 13 percent market share. GM has struggled in India since entering in 1994, with its Chevrolet models accounting for only about 5 percent of car sales in Asia’s second-fastest growing major economy. GM and Shanghai-based SAIC will start selling models in India next year that are similar to those now sold in China, Kevin Wale, GM’s China president, said in an interview. The alliance will challenge Maruti Suzuki India Ltd., the nation’s largest carmaker with a 41 percent market share, and Tata Motors Ltd., maker of the world’s cheapest car, the Nano. The partners may introduce as many as three light commercial vehicles and two passenger cars in India by 2012. The alliance also is targeting other developing markets. Last month, it started exporting Chevrolet Sail compacts made in Shandong, China, to Chile and Peru. The carmakers may ship elsewhere in Latin America, Egypt and the Middle East, Wale said. GM and SAIC said in December they would spend $650 million forming a new venture to build and sell passenger cars and small trucks in India. The automakers have not identified the first vehicles to go on sale next year. The two companies plan to use their expertise in China to gain a competitive advantage in India, said Judy Zhu, a Shanghai-based spokeswoman for SAIC. They’re confident the partnership will be successful, she said. Domestic passenger-vehicle sales in India rose 38 percent in October from a year earlier to 231,957 units, the Society of Indian Automobile Manufacturers said today in New Delhi. Deliveries in China rose 27 percent to about 1.2 million units in the same period. India’s passenger-car sales were 1.95 million in the year ended March 31. The government estimates sales may pass 3 million by 2015. During the past five years, India’s economy grew by an average 8.5 percent annually, and per capita incomes gained 70 percent. GM-SAIC will make cars and trucks weighing less than 1 ton at GM’s Halol and Talegaon plants, which have a combined annual capacity of 225,000 units, said Hua Foley, GM’s Shanghai-based spokesman. GM and its partners have 13 percent market share in China this year, chief financial officer Chris Liddell said Nov. 4. This is up from 3 percent in 2000, he said in a presentation for investors. Winning market share from Maruti and Tata will not be easy, according to Deepesh Rathore, India managing director at consulting company IHS Automotive in Gurgaon. The joint venture also needs to change consumer perceptions that Chinese products are of inferior quality, said Bill Russo, a Beijing-based senior adviser at Booz & Co.
M.S. Thapa, 72, owns a security guard service in suburban New Delhi that uses three Maruti minivans to transport workers. He said he would choose an Indian vehicle over a Chinese one in the same price bracket. Manoj Sharma, 37, a senior executive with a New Delhi-based consultant, said he won’t consider a GM-SAIC model when buying a six- or seven-seat passenger vehicle. He said GM cheapened its image by offering sales incentives such as a free 100,000- kilometer warranty. “Indians are an intelligent target audience that not only looks at price, but also the quality and the technology,” Sharma said. The closer ties come as GM aims to raise as much as $10.6 billion in an initial public offering, two people familiar with the plan said Nov. 1. SAIC chairman Hu Maoyuan said his company may participate in the offering. GM entered China in 1997 with a $1.57 billion contract to manufacture Buick Regal and Century sedans with SAIC. It now owns 49 percent of passenger-car venture Shanghai GM Motor Co. and 34 percent of minivan-maker SAIC-GM-Wuling Automotive Co.
GM is increasing its stake in the Wuling venture to 44 percent, pending regulatory approval in China, the U.S. automaker said in a filing related to its IPO. GM said it is buying the stake from the Wuling Group for technical services and $51 million in cash. SAIC owns 51 percent of Shanghai GM and 50.1 percent of SAIC-GM-Wuling. SAIC-GM-Wuling’s Sunshine minivan, which starts at about 30,000 yuan ($4,504), is China’s best-selling vehicle, with the company delivering more than 702,600 units this year through October. SAIC and GM cemented their market-leading position in China this year, selling 1.97 million vehicles through October, a 36 percent increase from a year earlier. That compares with second-ranked Volkswagen AG, which delivered 1.48 million cars through September. “The main challenge is to build up a supplier network and produce the model at a similar cost level as China,” said Ashvin Chotai, London-based managing director of Intelligence Automotive Asia, an industry consultant. 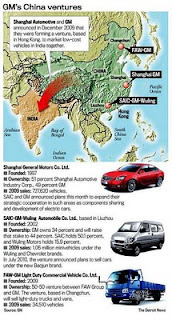 GM and SAIC need each other in order to succeed in India, said Zhang Xin, a Shanghai-based auto analyst at Guotai Junan Securities. GM has a good brand image and dealer network, and SAIC has experience in emerging markets. The success of their alliance contrasts with GM’s failed tie-ups with Japanese automakers and SAIC’s acquisition of South Korea’s Ssangyong Motor Co., which entered receivership in February after the global recession squeezed auto sales. SAIC paid $500 million in October 2004 for 49 percent of the Pyeongtaek-based automaker. GM sold a 20 percent stake in Suzuki back to the Japanese company in two stages in 2007 and 2008. It also ended a joint production arrangement with Toyota Motor Corp. in Fremont, California, in June 2009 as part of its bankruptcy reorganization. --Liza Lin and Subramaniam Sharma with assistance from Tushar Dhara in New Delhi. Editors: Ian Rowley, Michael Tighe, Jamie Butters. units ahead of the second largest market, the United States. growth would be in 2010.